Jimmy Kimmel asked random people if they were high. Some of them had to be lying. A new poll done by Yahoo reveals that 52 percent of Americans over the age of 18 have used marijuana (as Jimmy Kimmel points out, that's the main reason Taco Bell is in business). 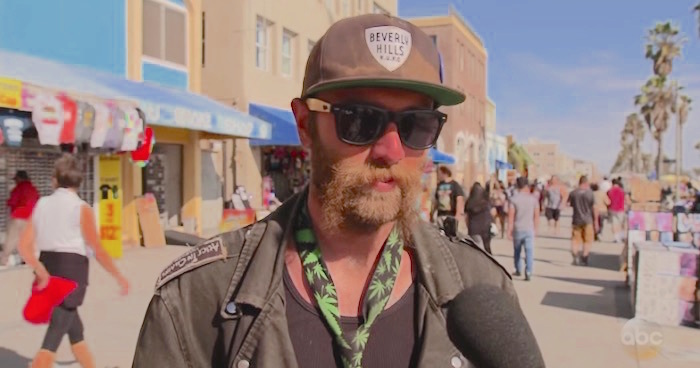 Since marijuana is legal in California, Jimmy Kimmel thought it would make an interesting "Pedestrian Question" segment to send staff to "pot hot spot" Venice Beach and ask random strangers if they were currently high. (It was, after all, 4/20, a.k.a. Christmas for stoners.) Some were, some weren't, and some almost certainly had to be lying. The clear winner was Nick, who admitted that yes, he was high. How high? "Really high, yeah. Welcome to Venice Beach." And why was he so high? "Oh, uh (pauses to drink water)…I smoked weed." DUH.